last night from the bridge on Maiden Lane Road. 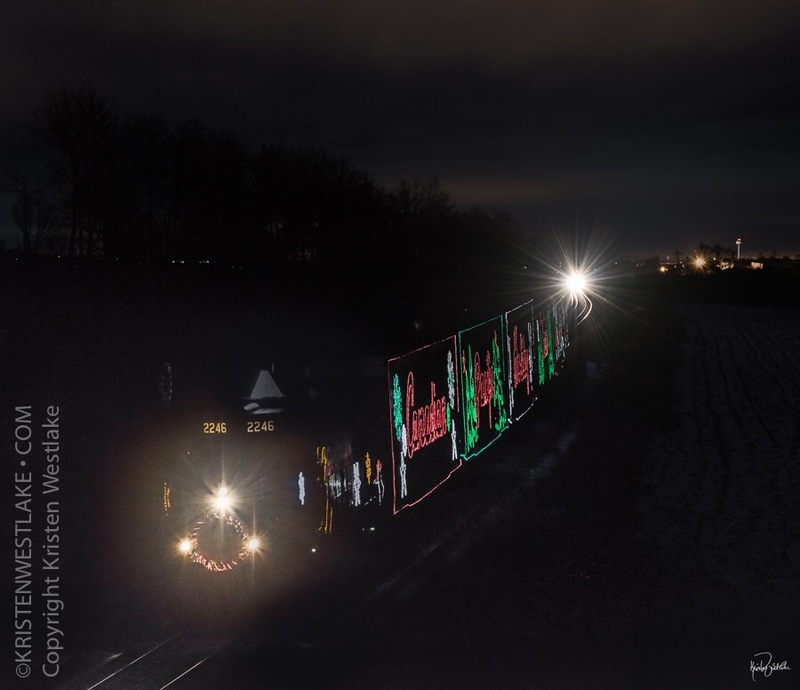 This is a 2 part image; the light you see way in the back towards town is when I first saw the light from the train and the rest is, as you see, the body of the lit up train. I parked up on the bridge alone in the dark but soon my friend Meg Schroeder came along in her truck. She parked facing me on the bridge and soon there were horse and buggies joining us as well. The Amish families were in amongst us .. all the little children eager and anticipating the train. I honestly think all of this camaraderie was the biggest joy of all. It just felt like I was wrapped up in a huge Christmas present! Meg was talking to me at the door of my Honda and with my window rolled down we were both trying to keep our teeth from clicking with chatter. An Amish man named David talked to us awhile and he called his brother Ezra from my phone and asked if he'd call when the train went through near his house, a few miles from where we were congregated. When I got the call I'd beep my horn, signaling the train. So Ezra called and I beeped and all the kids outside were ooohing and ahhhing and so was I ... After I watched the faces on the children and the parents gathering them up and back to their horse and buggies. I spoke with a few more of the Amish. I am so glad they are in our community. I love seeing them and I'm happy I got to experience such an event with them. 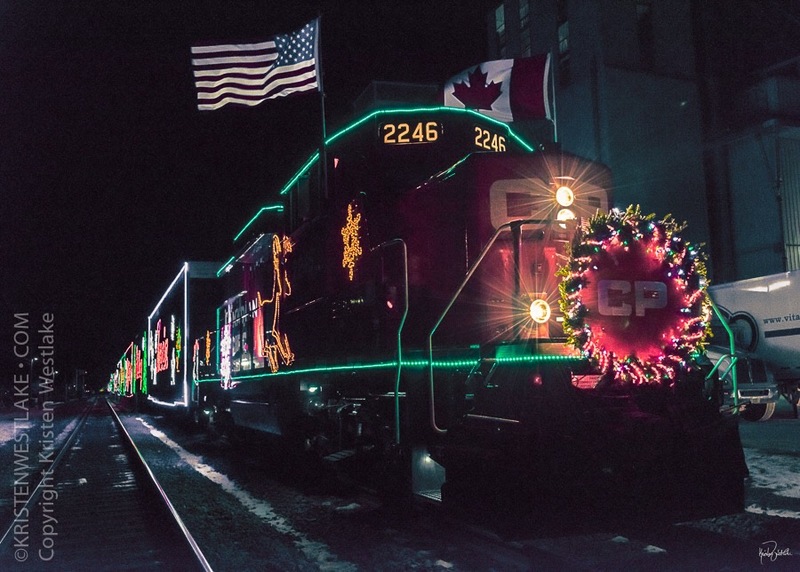 For me the Christmas train brought strangers together as friends and an already friend (Meg) into a forever treasured memory. The Christmas Train at its stop in Columbus, Wisconsin ..
After leaving the Amish families at the bridge where the train had come through, I followed Meg Schroeder through backroads to get to Columbus. The train stopped here to gather food to take to its destinations ..